Although he may have scored what definitely ranks as his biggest UFC win by defeating former champion Lyoto Machida (video highlights here) in the main event of last night’s (Sat., June 27, 2015 UFC Fight Night 70 from the Seminole Hard Rock Hotel and Casino in Hollywood, Florida, the ‘Soldier of God’ didn’t do himself any favors by blasting the U.S. Supreme Court’s decisions to finally allow gay marriage on Friday. 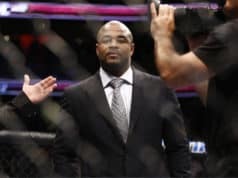 The notoriously religious Romero spoke out against the decision, urging Americans to ‘go with Jesus, but not Gay Jesus.’ It was a bizarre moment that his employers understandably found to be bit inappropriate, as the surging contender was forced to issue an apology at the event’s post-fight presser. Watch his questionable post-fight speech above.